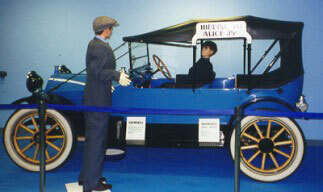 Hibbing is recognized as the birthplace of the bus industry in the United States. Visitors can now see and hear the story at Hibbing's newest attraction which includes seventeen historical buses. To start the tour, visitors pass through a tunnel that comes alive with auto sounds of 1914 and the Hupmobile that could not be sold. The story continues with the men and machines that created Greyhound Bus Lines using pictorial displays, hundreds of artifacts and memorabilia, audio-visual presentations, and the video "The Greyhound Story" from Hibbing to everywhere. A diorama of WW II illustrates how Greyhound contributed to the war effort. Other exhibits help the visitor understand how, with a Hupmobile car they could not sell and a two mile route, Greyhound grew to be the largest bus company in the world. Take a look inside the museum! Take a look at the buses!